Calculator Camera – Can Your DSLR Do That? | OhGizmo! Calculator Camera – Can Your DSLR Do That? If you ask any professional photographer I’m sure they’ll tell you that the one feature today’s digital SLR cameras are missing is a calculator. So until Nikon and Canon get their acts together and start listening to what features their users really want most photographers will have to settle for this Digital Card Calculator Camera. 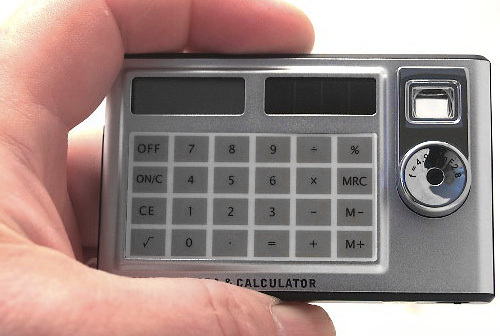 The calculator looks to be solar powered (even though the site mentions a 1.5V button battery) so there’s a chance it won’t drain the camera’s own battery and includes all the standard functions you’d expect to find on a crappy knock-off. The camera itself also benefits from cutting costs with a resolution of either 1280×960 or 640×480 and 8K of internal memory allowing you to store about 32 photos at the higher res. It connects to your PC via USB but you’ve only got v1.1 support for downloading the 8K of photos you took. It’s currently available from CrimeBusters911.com which is ironic since the $69.99 price tag seems like a crime in and of itself. They should named it “Camculator”, some people just don’t see a branding Opertunity when it is just infront of them. I looks like, for me, that all gadgets including digital camera will turn into an all-round gadget. Nowadays, we can find also digital camera with the capability of wireless connection to share and connect each other.